A new review has been added to the site today! Ceri Laing has taken a look at the latest Douglas Adams audiobook, Dirk Gently's Holistic Detective Agency, which was released recently by BBC Audiobooks. Click on the sleeve image, left, or here to read Ceri's review. Many new titles have been added to the Incoming database this week, including recent ITV2 bonkbuster Secret Diary of a Call Girl; George Clooney's hit thriller Michael Clayton; straight-to-DVD horror sequel Wrong Turn 2: Dead End and David Renwick's bittersweet sit-com Love Soup. New listings include the first sightings of TV favourites, notably The Two Ronnies - Series 3; The Fugitive - Series 1 and Oz - Series 4. Check it out - there's something for everyone this week! Giant crocodile thriller Primeval has been re-named for its UK release, presumably to avoid confusion with the recent ITV TV series. It's now known as Primeval Kill. Twentieth Century Fox Home Entertainment has issued a recall notice to retailers about Stargate SG-1 - Season 10 - Volume 3. This was due to "an artwork / BBFC certification issue". 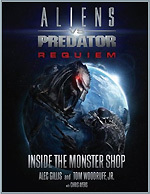 Titan Books will release Alien Vs Predator: Requiem - Inside The Monster Shop, a behind-the-scenes look at the latest film in the Alien and Predator film series, on January the 18th. The book looks at the work of special effects supervisors Tom Woodruff Jr and Alec Gillis, of Amalgamated Dynamics, who have worked on many films in the series, as well as some of the Tremors, Terminator and Spider-man films. The 128-page book has an RRP of £14.99. Amazon.com has it available for pre-order for £9.89, here. In tune with the festive season, the next BFI IMAX After Dark All-Nighter on Saturday 8 December is a song and dance spectacular with four favourite modern musicals to get you feeling ready to party. Why not come down with all your friends and make a real night of it, 10 hours long! Hot on the heels of the sell-out Lord of the Rings and Bourne Trilogy All-Nighters comes an entire night of music and dancing. The evening kicks off with two 1980 cult classics; the downright disco favourite Fame and the crazy rhythm and blues frenzy that is The Blues Brothers. In the wee small hours it’s showtime with Chicago, as Catherine Zeta-Jones and Renée Zellweger strut their stuff. Then Nicole Kidman and Ewan McGregor pair up in the gorgeous Moulin Rouge. Tickets are £25 and £18 for concessions and special rates for groups. Hot dogs and snacks are on sale all night, with alcoholic and soft drinks available at the bar and free teas and coffees on offer to keep you on your toes. All films will be shown in 35mm, filling about a third of the giant screen. The event is certificate 15 and will finish at 9.10am approx on Sunday morning. A trip to Britain’s biggest screen is also the thing to do this December and Christmas holiday for a magical 3D cinema treat. Back by demand and enjoyed by audiences of all ages, The Polar Express 3D directed by Robert Zemeckis and starring Tom Hanks returns for a fourth year. The film made cinema history in 2004 as the first ever full-length feature converted into IMAX 3D. Children love to grasp at the falling snowflakes, duck as the train screeches into their laps and feel the howl of the steam whistle through 12,000 watts of surround sound. Beowulf 3D, also directed by Robert Zemeckis, opened at the BFI IMAX 10 days ago and has been playing to packed houses every night with 18,500 tickets sold so far. Beowulf 3D combines digitally enhanced live-action filmmaking technology (first seen in The Polar Express) with an all-star cast that includes Ray Winstone, Anthony Hopkins, John Malkovich, Robin Wright Penn and Angelina Jolie. With family viewing in mind, the cinema is showing other IMAX films (average running time 40 mins) where the 3D immersive sensation takes you right into the screen. National Geographic’s Sea Monsters 3D: A Prehistoric Adventure brings to life the extraordinary marine reptiles of the dinosaur age. Back on dry land is Dinosaurs 3D: Giants of Patagonia, the closest you can get to actually being in the presence of these eternally fascinating, extraordinary creatures. The BFI IMAX is located at South Bank, London SE1. Nearest tube is Waterloo. Tickets can be bought in advance from the ticket desk or by telephone on 0870 787 2525 or online from www.bfi.org.uk/imax. 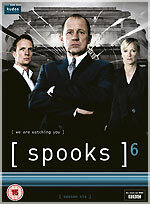 Ticket prices: IMAX DMR films Adults £12.00, Children £8.00, Concessions £9.75. IMAX films: Adults £8.50, Children £5.00, Concessions £6.25. Musical All-Nighter: Adults £25, Concessions £18. Discounts for group bookings: Discounts are available for groups of 10 or more and the flexibility of the cinema enables groups of 40 or more to arrange their own morning screening of IMAX films. Contact David West, Group Sales Manager at david.west@bfi.org.uk or Tel: 020 7960 3120.